Images from the 2015 MN Air Spectacular air show in Mankato, MN. This event was held on June 27, 2015. 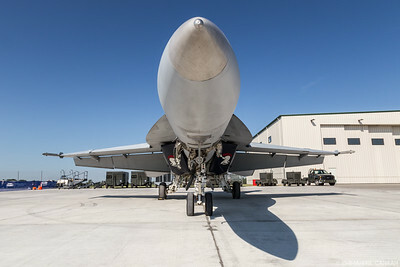 The U.S. Navy Tac Demo team's F/A-18F demo aircraft shows off an intimidating profile that no one would ever want to be on the business end of. 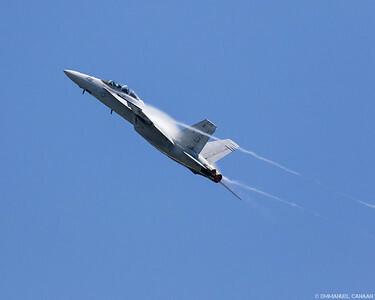 It's hard to deny that the U.S. Navy Tac Demo team's F/A-18F has got some serious buns. 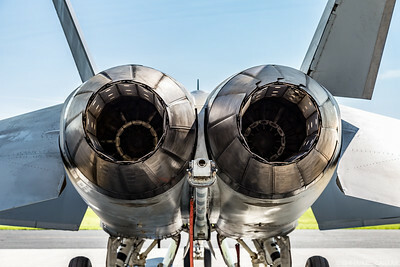 In fact each of these engines can produce as much thrust as a 737 engine when the afterburners are engaged (22,000 lbf). 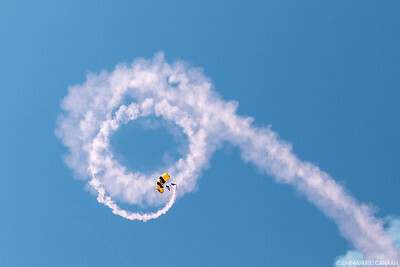 A member of the U.S. Army Golden Knights parachute team opens the MN Air Spectacular with a spiraling descent that strongly resembles a curlicue. 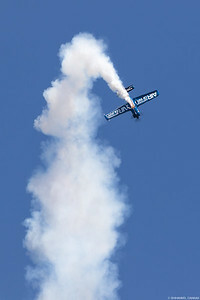 Master aviator Sean D. Tucker tumbles through the sky during his performance at the 2015 Minnesota Air Spectacular in Mankato, Minnesota. 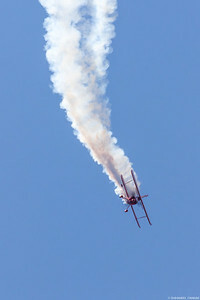 Aerobatic star John Klatt dives back down towards the ground during his performance at the 2015 Minnesota Air Spectacular in Mankato, Minnesota. 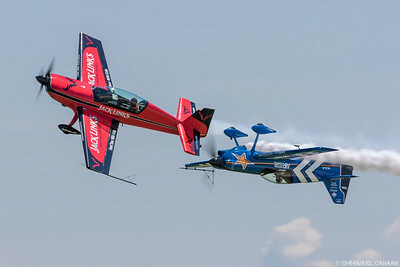 An optical illusion gives MN Air Spectacular attendees the impression that John Klatt's Air National Guard Extra is about to shred the tail of Jeff Boerboon's Jack Link's Extra with his prop as they perform a low altitude formation pass. 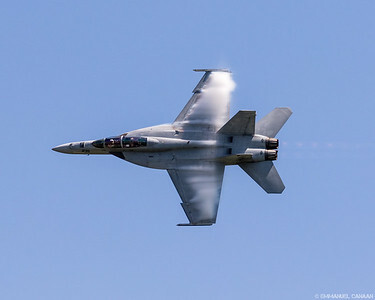 A U.S. Navy Tac Demo team F/A-18F Super Hornet steals a page from Jason Derulo's playbook and rides solo at the 2015 Minnesota Air Spectacular in Mankato, Minnesota. 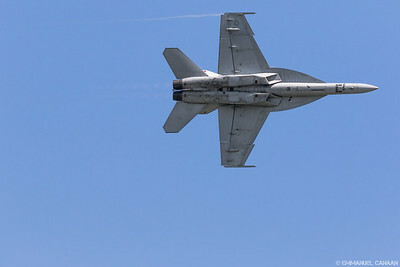 A U.S. Navy Tac Demo team F/A-18F Super Hornet pilot pulls back hard on the stick in a high-G maneuver during the 2015 Minnesota Air Spectacular in Mankato, Minnesota. 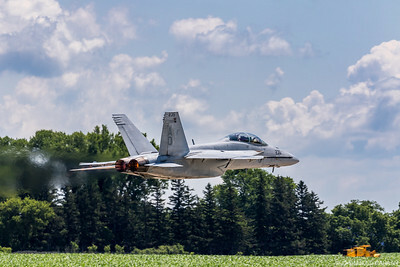 The U.S. Navy Tac Demo team's F/A-18F Super Hornet dusts some Minnesota crops with a mixture of sheer awesomeness and badassery. Before the term 'vaping' entered the world lexicon, there was an entirely different form of vapor production. Here the U.S. Navy TAC Demo team schools the world in how they produce vapor at the 2015 Minnesota Air Spectacular in Mankato, Minnesota. 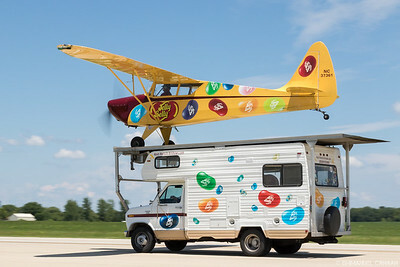 Kent Pietsch lands his Interstate S-1A-65F Cadet on the top of a moving RV during his comedic air show at the 2015 Minnesota Air Spectacular in Mankato, Minnesota. 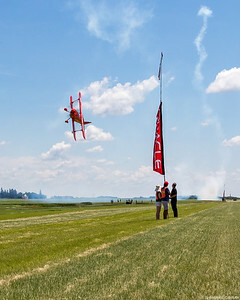 Just another day at the office for Sean D. Tucker of Team Oracle as he passes by the pole holders in preparation for his ribbon cut during the 2015 Minnesota Air Spectacular in Mankato, Minnesota. 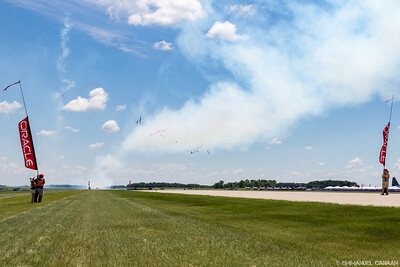 Aerobatic superstar Sean D. Tucker​ passes under the ribbon in his Challenger III, barely 8 feet off the ground at the 2015 Minnesota Air Spectacular​ in Mankato, Minnesota. 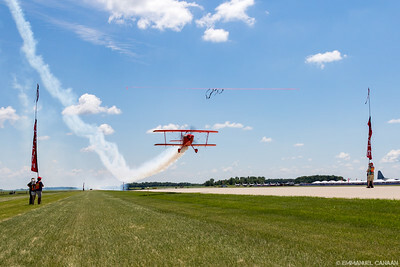 Aerobatic superstar Sean D. Tucker​ shreds a ribbon as he screams along at 215 mph in his Challenger III, just 15 feet off the ground at the 2015 Minnesota Air Spectacular​ in Mankato, Minnesota. Sean D. Tucker blows by so fast after his ribbon cut that the ribbon is still falling to the ground in tatters and the pole holders' minds are still looking at where he was, not yet registering that he's long gone. Yeah, baby! This scene was captured at the 2015 Minnesota Air Spectacular in Mankato, Minnesota. 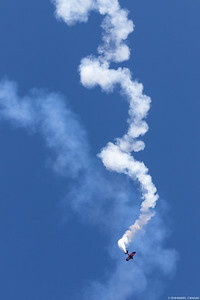 Aerobatic star Jeff Boerboon tumbles to the ground in his jet-powered 1929 Taperwing Waco, better known as Screamin' Sasquatch, at the 2015 Minnesota Air Spectacular in Mankato, Minnesota. Aerobatic star Jeff Boerboon cranks his jet-powered 1929 Taperwing Waco, better known as Screamin' Sasquatch, through some high-G maneuvers at the 2015 Minnesota Air Spectacular in Mankato, Minnesota. 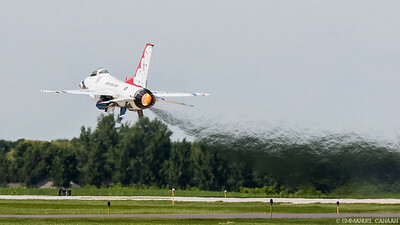 In a nod to PZEV automobiles, the U.S. Air Force Thunderbirds create a new category of vehicle, the Massive Emissions Aerial Vehicle (MEAV) by rocketing out of Mankato, Minnesota with full afterburner (to the great delight of the 2015 Minnesota Air Spectacular crowd). 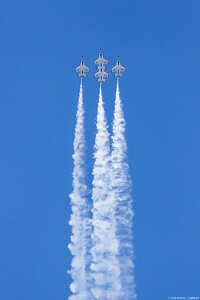 The United States Air Force Thunderbirds blaze trails in the sky as they rocket upwards at the 2015 Minnesota Air Spectacular in Mankato, Minnesota. 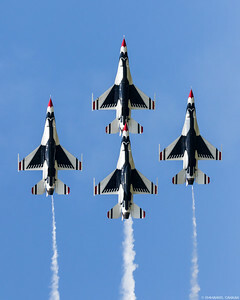 A quartet of USAF Thunderbirds climbs high into the sky over the crowd at the 2015 Minnesota Air Spectacular in Mankato, Minnesota. 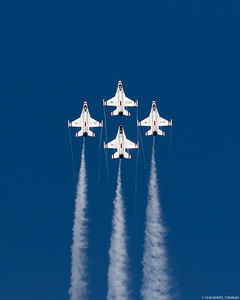 Each time they perform, the U.S. Air Force Thunderbirds inspire legions of fans to become aviators. 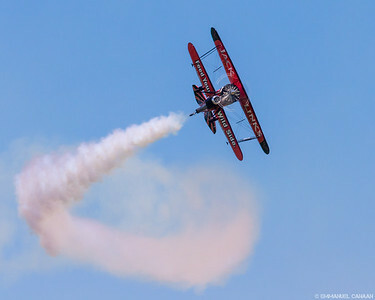 They are seen here executing a beautiful, inspirational maneuver at the 2015 Minnesota Air Spectacular in Mankato, Minnesota. 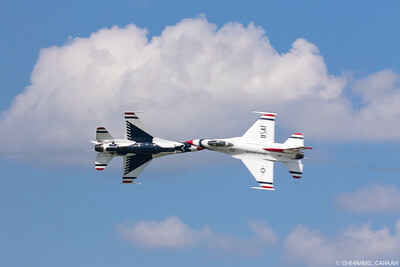 The U.S. Air Force Thunderbirds perform a high-speed, head-on pass during the 2015 Minnesota Air Spectacular in Mankato, Minnesota. 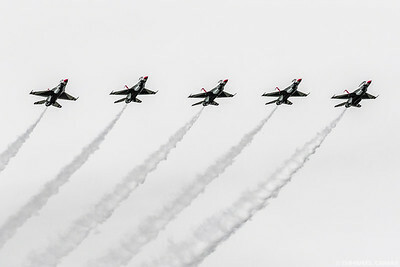 The U.S. Air Force Thunderbirds aim high at the 2015 Minnesota Air Spectacular in Mankato, Minnesota. 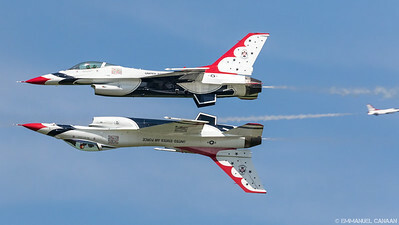 Performing a maneuver reminiscent of the famous Top Gun scene, Major John Curtis and Captain Nicholas Eberling of the U.S. Air Force Thunderbirds demonstrate perfection in motion with their famous Calypso Pass. 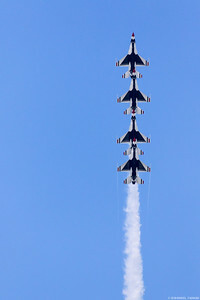 The U.S. Air Force Thunderbirds queue up in a race to fulfill the Air Force's motto of "Aim High". 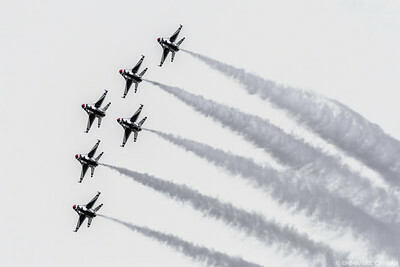 The USAF Thunderbirds execute a perfect diamond formation at the 2015 Minnesota Air Spectacular in Mankato, Minnesota. 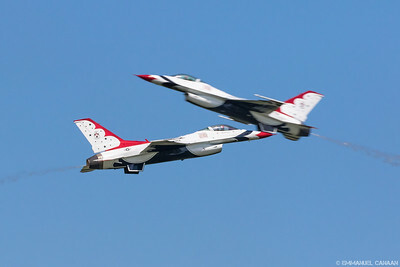 Two U.S. Air Force F-16D Thunderbirds make a high speed pass at the 2015 Minnesota Air Spectacular in Mankato, Minnesota. 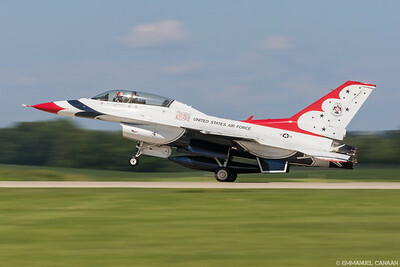 Two U.S. Air Force F-16D Thunderbirds make a quick break to avoid disaster during high speed pass at the 2015 Minnesota Air Spectacular in Mankato, Minnesota. Captain Nick Eberling, Opposing Solo and pilot of Thunderbird 6, roars out of Mankato, Minnesota during the 2015 Minnesota Air Spectacular. 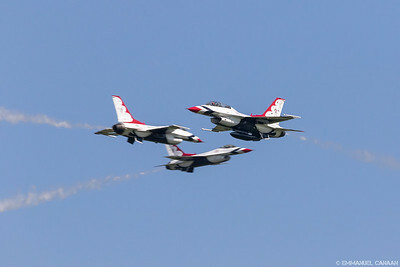 The USAF Thunderbirds make a slow pass by the crowd to show of the beauty and power of their F-16D aircraft at 2015 Minnesota Air Spectacular in Mankato, Minnesota. 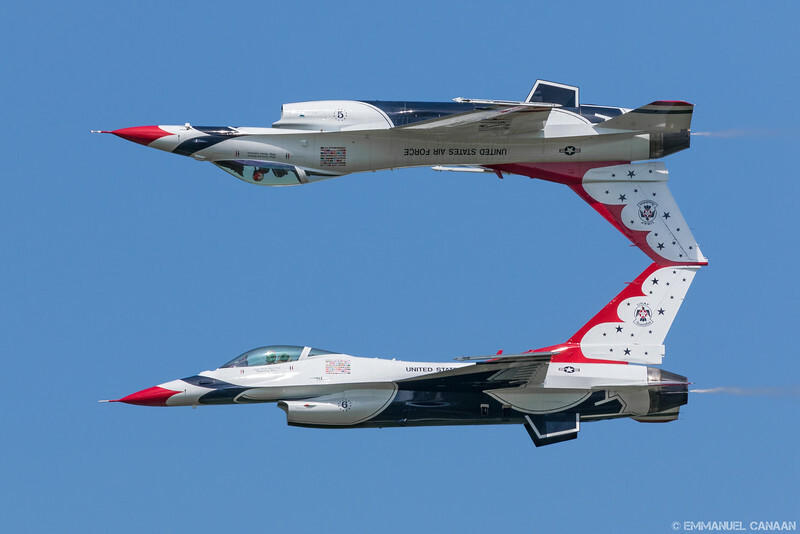 Demonstrating the type of precision that military aviators are known for, the U.S. Air Force Thunderbirds fly side-by-side over the 2015 Minnesota Air Spectacular crowd, while maintaining a very tight, precise formation. 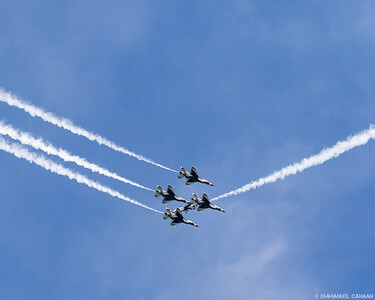 The U.S. Air Force Thunderbirds demonstrate the inherent beauty of flight as they soar high into the sky at the 2015 Minnesota Air Spectacular in Mankato, Minnesota. 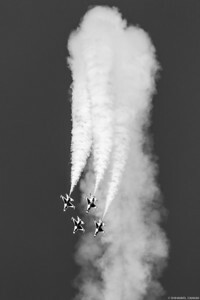 The U.S. Air Force Thunderbirds use their smoke trails to form the beginnings of a heart in the sky at the 2015 Minnesota Air Spectacular in Mankato, Minnesota. 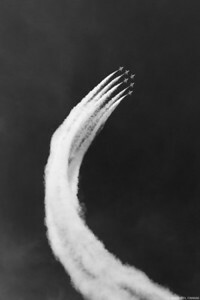 The U.S. Air Force Thunderbirds use their smoke trails to form the bottom of a heart in the sky at the 2015 Minnesota Air Spectacular in Mankato, Minnesota. 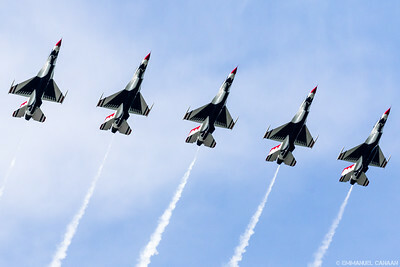 The USAF Thunderbirds demonstrate the meaning of perfection as they soar past the crowd in a picture-perfect formation at the 2015 Minnesota Air Spectacular in Mankato, Minnesota. 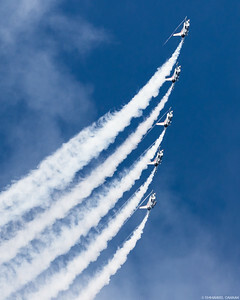 The master aviators of the USAF Thunderbirds stack together so tightly that any wrong movement could spell disaster. They take this risk every day so that we may be awed and inspired by the power of the United States Air Force. 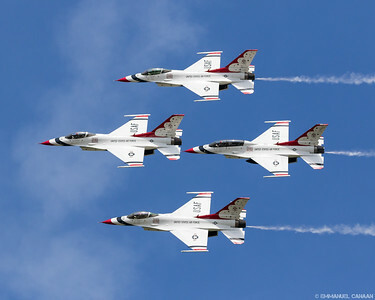 Thank you to all of the Thunderbirds team for inspiring a new generation of aviators every time you perform. 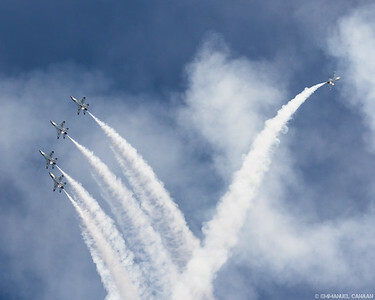 The U.S. Air Force Thunderbirds aim high as they soar above the crowd at the MN Air Spectacular in Manakto, Minnesota. Mimicking the gridlock most airshow attendees experience on the way to a show, the U.S. Air Force Thunderbirds fill the sky with their beautiful F-16s. 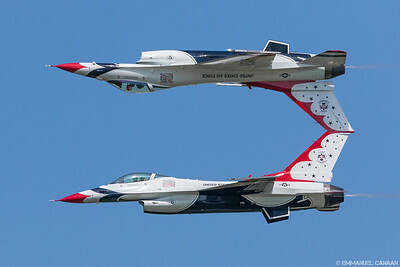 The United States Air Force Thunderbirds 5 and 6 perform their famous reflection pass at the Minnesota Air Spectacular while one of their teammates races to set up for the next maneuver. 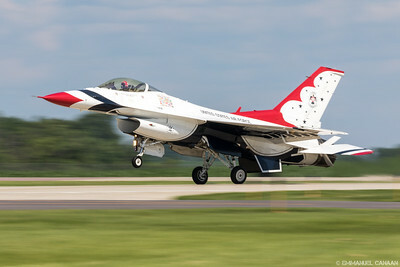 Major Joshua Boudreaux of the U.S. Air Force Thunderbirds, brings his magnificent flying machine in for a silky smooth touchdown after a perfect performance at the 2015 Minnesota Air Spectacular in Mankato, Minnesota. 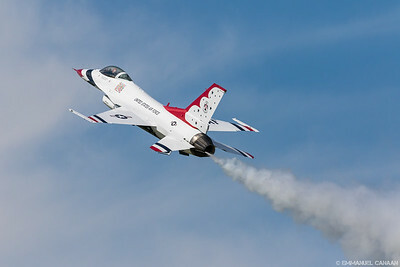 Slot pilot Major Curtis Dougherty of the U.S. Air Force Thunderbirds makes it look easy as he lands one-handed while waving to the crowd after a successful performance at the Minnesota Air Spectacular.